Hemp provides the unique opportunity to create an innovative value chain which is both socially just and ecologically sustainable. The percentage of hemp that is organically grown versus conventionally grown is the highest relative to all other grains grown in North America. 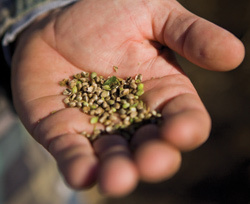 The price organic farmers are receiving for their hemp is already fair, and many of these farmers are also ensuring fair wages and working conditions for their farmworkers. Because of strong demand from organic consumers for food that is not only organic but also fair, our co-operative of organic family grain farms is certified to the Food Justice domestic fair trade standard (www.agriculturaljusticeproject.org) by Quality Certification Services (www.qcsinfo.org). We chose this social justice standard because it was developed by both farmers and farmworkers. Every farm with hired labor is audited in person by an inspector, along with a farmworker representative from a local or regional advocacy organization. The farmworker representative is present not only to insure the fairness of the process, but also to provide other support such as guidance regarding further educational opportunities or immigration services. The interview process is integral to verifying a fair worker/farmer relationship. The farmer and all farmworkers are interviewed together, then the farmer and farmworkers are interviewed separately, and finally each individual farmworker is interviewed. This ensures that all individuals on the farm have a voice. The main principles of the Food Justice standard are that farmers are paid fair prices and that farmworkers have access to collective bargaining, are paid fair wages and are working under safe conditions. To ensure the integrity of domestic fair trade, our co-op also initiated the fairDeal program (www.thefairdeal.org). Mission-based companies and farmer-owned organizations, in solidarity with farmworkers, NGOs and active citizens, are leading the way. Companies like Farmer Direct, Dr. Bronner’s Magic Soaps, Manitoba Harvest, Hemp Oil Canada and Nutiva strongly support domestic fair trade hemp. There is also significant commonality between ethical fair trade proponents and hemp consumers, and thus hemp is helping to make domestic fair trade a reality in North America. For more information about domestic fair trade in North America, visit: www.theDFTA.org. We absolutely NEED to able to grow Hemp WORLDWIDE. It is OBSCENE that it is illegal to grow it. NO Plant should EVER be “illegal” ; it is SO wrong to say ANY Plant is against “the law” .